In my two previous posts [first|second] in this series, I suggest some reasons why history departments should care, a lot, about improving connections to our nearby community colleges. In this final post in this series I want to suggest two more reasons why we need to start building much closer and more strategic relationships with community colleges (and K-12 schools) in our institutions’ primary markets. The long term decline in the number of history majors nationally has been well documented by Robert Townsend, formerly at the AHA. In addition to the factors Townsend sites in the article linked here, we have to confront the fact that unless we find a way to make the history major more appealing to female students, our discipline will be swimming in a smaller and smaller pond every year. And the easiest way to get to know these students is to get to know our colleagues at the community colleges, to find interesting and generative ways to work with them, and to build long term partnerships around teaching, research, internships, study abroad, and other similar opportunities. Having visited many community colleges over the years, I feel safe in saying that overtures to our colleagues on these campuses, so long as they are made to colleagues, will be warmly embraced. Without a doubt, the most important issue facing higher education in the coming decade will be finding ways to deal with the documented fact that more than half of all public school children in the United States now live in poverty. In addition to being a national disgrace, this stark fact means that finding ways to improve access to higher education is going to be (or better be) on the top of the agendas of every leader of every college and university in our country. What can we do about that, you might ask? After all, we don’t set tuition rates or financial aid policies at our institutions. Defining the problem this way is very simple, but doesn’t really work, because it lays off the problem on others, making it easy for us to throw up our hands in despair. Of course access is, above all things, governed by financial factors, and of course we have little to no influence on those factors. But that’s not the same thing as having no seat at the table when it comes to discussions of access. Access is also defined by aspiration, preparation, and retention of students. As historians, we can engage with our local schools to help students aspire to college and to be prepared for college. In his presidential address to the AHA in 1985, Princeton historian Arthur Link argued passionately for just such an engagement–not for exactly the same reasons, but with grand vision nonetheless. I chaired a panel at our most recent annual meeting “How Teaching Became a Mission of the American Historical Association from the 1960s” in which the panelists similarly discussed the vital and active role the AHA and its members used to play in the schools. At that panel, I raised my hand to admit that in my 14 years at George Mason University I have never reached out to the faculty at Robinson Secondary School that is essentially right across the street. So, guilty as charged. The other way we can have a major impact on student access is by becoming full partners in our institutions’ student retention efforts. Study after study shows how important faculty are to student success, not only in the classroom, but also in so many out of the classroom ways. We don’t need to work only with history majors–we can be mentors to students across the disciplines, can help our administrative staff who worry about retention every day with any number of initiatives–and the results of these efforts will be positive not just for our institutions, but for our society as a whole. Sure, this sort of engagement might not improve the number of history majors, but it is without a doubt the right thing to do. Over the past few years I’ve had many conversations with colleagues around the country about falling history enrollments and in most of those conversations my colleagues have expressed a sense of powerlessness when it comes to changing their enrollment fate. If we leave it to others to improve our numbers then we are indeed powerless. But if we engage with the enrollment efforts of our institutions, with our community college colleagues, and with K-12 schools in our communities, we are anything but powerless. This entry was posted in Posts and tagged community colleges, enrollments, gender, k-12 schools on January 23, 2015 by Mills. The March 2014 issue of Perspectives includes a very clear analysis of the most recent IPEDS data on history BAs by Allen Mikaelian. Everyone currently teaching college history or planning to do so should read this article. Why? A quick glance at this graph should at least given one pause. 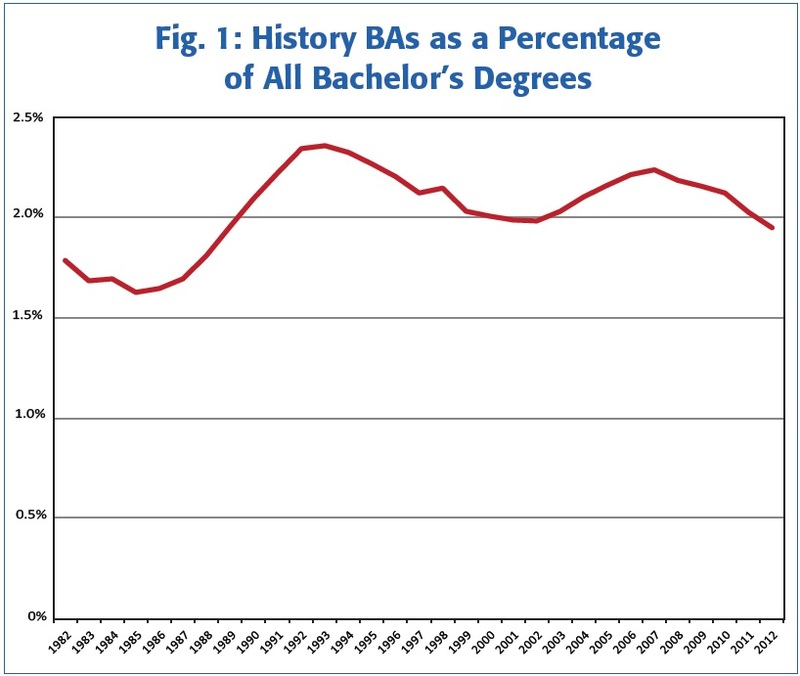 What is shows is a five year decline in history’s share of all bachelor’s degrees awarded in the United States. In the data analysis business, we call this a trend. In an era of stagnant or declining funding for colleges and universities, this is a particularly bad moment for history departments to be smaller players on the enrollment stage. While the overall number of bachelor’s degrees awarded in history is actually up slightly, deans, provosts, and campus accounting types all take note of a discipline’s relative share of resources provided and consumed and so graph results like this one are a real (not imagined) problem. As I have written previously, one reason for history’s relative decline as a share of overall degrees awarded is the inescapable fact that, at the undergraduate level, our discipline has a gender problem. The 2011-12 IPEDS data (the most recent available) show that 57 percent of all bachelor’s degrees in the United States were awarded to women, but only 40 percent of degrees in our field went to women. That’s a problem. And it’s not getting better. The IPEDS data show that history is also getting whiter by the year, even as higher education as a whole is becoming more diverse by the year. What’s new to me in Mikaelian’s article is that the share of bachelor’s degrees in history awarded by our most research intensive universities (the “very high” category in the Carnegie classification) has fallen substantially over the past 25 years. In 1989, 38 percent of all bachelor’s degrees in history were awarded at these universities, almost all of which have very large history departments with substantial doctoral enrollments. But in 2012, only 31 percent of bachelor’s degrees in our field came from these departments. And, as Mikaelian points out, those same institutions experienced only an overall drop in bachelor’s degrees of three percent, so there has been a real drop in history degrees at our most research intensive departments. I’ve spent a lot of time in university administration over the past five years and one thing I know for sure is that a measurable decline in degrees awarded is something that gets noticed, even if that decline took 25 years. There just aren’t enough resources to go around any more and so those fields that are generating more tuition revenue are blessed with more resources, while those generating less revenue see their budgets declining. That’s the inescapable reality of higher education in 2014. What does this mean for the future of our discipline? It means that in the near term we shouldn’t be surprised to see tenure lines at the most research intensive universities being shifted away from history. Unless those faculty who remain agree to teach more undergraduates (unlikely in most cases), those large departments will either become smaller still, or will begin relying on ever more contingent labor for their undergraduate teaching. More worrisome than any possible decline of the biggest and most research intensive history departments is the on-going gender problem we have at the undergraduate level. If we don’t start coming up with new ways of thinking about that long standing problem, we’re all in the same boat — a boat that has sprouted more than a few leaks. This entry was posted in Posts and tagged data, enrollments, gender, undergraduate teaching on March 14, 2014 by Mills. As a follow up to my previous post about history’s gender problem, I now want to offer some possible solutions for our discipline. Before I do, however, a bit more context on the gender problem History has here at George Mason seems warranted. Of the undergraduate programs in our college with more than 100 declared majors, only three have enrollments where fewer than two-thirds of those declared majors are female — History (40%), Government (41%), and Economics (34%). Every other substantially enrolled major in our college is more female than the university average of 62%. Further, our MA enrollments are similarly skewed. Overall MA enrollments in the College of Humanities and Social Sciences are 60% female, but in History, MA enrollments are only 42% female. Thus, the problem I identified in my previous post extends beyond the undergraduate years into the MA. Given what Rob Townsend has written for the American Historical Association, I suspect we are very typical of history departments nationwide. What then can be done to deal with history’s gender problem (and not just at George Mason)? Too often, the standard answers to this sort of gender problem in an academic discipline are to increase the number of female faculty and/or to teach more courses that will appeal to female students. To my mind, the first of these is pretty obvious and needs constant attention. Even in a department that is changing rapidly, only 40% of the tenure track faculty in History here at Mason are female, so further attention to finding a full gender balance is something we’ll need to continue to work on. But it’s the second of those proposed solutions that I think is off the mark. First of all, such phrasing assumes that male and female students can’t or won’t be interested in the same things about history, and second, it tends to turn on simplistic notions about preferences, such as male students want military history (and women don’t) and/or female students want women’s history (and men don’t). While I think information about student preferences for course content is important, the problem is more complex than simply offering a few more of this or a few less of that type of course. Instead, I think the problem seems to lie in the way history is taught and in the ways we conceive of and describe to students what they might do with their degrees in history. One of the most important reasons I say “seems to” here is that there is very little in the way of solid data on the role that gender plays in the choice of major in college, and what little data exist tend to be focused on the much greater gender gap in the STEM fields. Nevertheless, it is possible to glean some useful information from some of the STEM-focused studies. For instance, in a 2009 report by Basit Zafar, an economist at the Federal Reserve Bank of New York (“College Major Choice and the Gender Gap“), offers some very interesting data on the role gender plays in the choice of major. Zafar’s study was limited to students at Northwestern University and so does not pretend to be broadly predictive. However, it does offer a very rigorous analysis of data. Zafar concludes that gender differences in major choice between men and women are not based on expectations of future income, nor are they explained by differential levels of confidence in one’s academic abilities, nor (for those with US born parents) do beliefs about the status of a future job resulting from a major play an important role in the choice of major. Instead, Zafar concludes that for those with US born parents the most important factor in the choice of major is the degree to which one expects to enjoy the coursework and the degree to which one expects to enjoy a future career tied to that major, with female students having a much greater concern for these two factors than male students (pages 25-28). For those with foreign born parents, whether male or female, perceptions of the status of the major and the status of jobs that might result from that major play a more important role for both male and female students, but especially for male students (20). Assuming for a minute that Zafar’s data could be replicated across a much broader sample of students, then we need to think very carefully about the ways we teach about the past. Ask a group of graduating history majors how much diversity there was in the teaching methodologies they experienced in their history courses and I think it’s a safe bet that they will say, “not much.” The vast majority of history classes follow a general lecture-plus model in which professors mostly lecture with some discussion time thrown in daily or weekly. At some point this style of teaching has to become boring, no matter how good the professor is at delivering it. We also need to think very carefully about the ways we talk about careers our students might pursue after graduation. As the digital economy rolls over us, the work our students will be doing after graduation is increasingly very different from the work they might have done five or ten years ago, but by and large our descriptions of that work remain the same, rooted in a series of generalized notions about what one might do with a liberal arts degree. It’s time for us to get much more specific about the jobs our students are getting/will get in the new economic reality they’ll be living in. Which brings me to my final point — these two considerations do not exist in isolation from one another. Instead, they are inextricably linked. One way to increase the levels of enjoyment our students experience (or expect to experience) is to begin creating courses that break the lecture-plus model and begin to incorporate project work, service learning, and other forms of “doing history.” Rather than continuing to talk to them or with them about the past, it’s time to develop courses that get them into the field, into the archives, into employment sites, at museums or historic sites, in short, give them a chance to exercise their creative energies. One more great lecture or one more well thought out five page essay assignment just isn’t going to do that. Examples of what I’m talking about exist all over the country, but they are the exceptional courses in history curricula. If we are going to take seriously the notion that our gender problem — which is very real — needs to be addressed, then it’s time for a national conversation about how changing our curriculum is the way to address that problem. This entry was posted in Posts and tagged enrollments, gender, teaching on April 16, 2013 by Mills.